Buzet? Did you ever heard about Buzet? No? Well I will try with this post to enlighten you. Let’s go back to the southwest of France to discover it together. Often confused with Bordeaux or even more confused for being one of the numerous Bordeaux appellations, Buzet has always lived in the shadow of Bordeaux. It is partly due to the fact that during the Middle-Age period, Buzet belonged to the Bordeaux wine region; but it is also because even nowadays, Buzet wines, which are predominately red, are produced with the same prominent Bordeaux red grape varieties: Cabernet Sauvignon and Merlot. Although Buzet are usually darker, fruitier, spicier and earthier than Bordeaux, they both have somewhat similar tasting features. The village of Buzet, which gave its name to the surrounding eponymous wine region, is located about 110 kilometers (about 60 miles) southeast of Bordeaux, about halfway between Bordeaux and Toulouse when you drive south on the Highway A62, in the Lot-et Garonne. Buzet is a short name for “Buzet-sur-Baïse”, named after the Baïse River, an affluent of the Garonne River, near which the Romans first built it centuries ago, and also where, some centuries later, influential Lords of Gascony established their quarters and built their Castle near by. Consequently, Buzet gave its name to the wine region, which is now regrouping about 900 hectares of vineyards that roughly stretches between Agen and Marmande, in the heart of Gascony. All Buzet vineyards enjoy a continental microclimate slightly influenced by the proximity of the Atlantic Ocean yet protected by the Landes forest, which allows for a good amount of sun and ideal ripeness. Growing conditions are imparted by the west wind, which aerate the vines, and the nearby Garonne River, which provides just the right amount of moisture for the grapes to fully ripen. The main economic activity of Buzet has always been the agriculture, and more especially the viticulture. From the village archives, it easy to attest that the wine of Buzet had their glorious days back in the 13th and 15th centuries; then were fairly reputed in the 18th century; rediscovered during the 19th century when the village experienced a needed renaissance, and enjoyed a fair amount of recognition up until early 20th century. The Baïse River and the Canal de Garonne inaugurated in 1856, also brought a lot of commerce activities. However, due to the Phylloxera plague, which occurred between 1860 and 1930 and devastated more than 75% of most European vineyards, Buzet wine quality dropped and the village became more renowned for its pencil factory than its wines, especially in between the two world wars, up until the mid-1950. But wine production has always prevailed, adored by the locals, and more especially the Lords and Bourgeois since the Medieval times, it was normal that wine production had to resurface. Buzet is now somewhat known worldwide through the “Cave des Vignerons de Buzet”, which was established in the 1950s, thanks to the will of a handful of growers who wanted to free themselves from the tutelage of traders and Négociants. It is both a qualitative and commercial success, beyond the hopes of its creators. La Cave des Vignerons de Buzet accounts for about 90% of total production of Buzet wines. In 1973, the region was elevated to the rank of Buzet AOC, a well-deserved victory that once again confirmed the will and determination of its growers and established the quality of Buzet wines, once and for all marking the difference with Bordeaux, taking the shadow away. Rare are the independent producers, but there are a few that grow, vinify and bottle their wines at the estate. La Cave des Vignerons de Buzet produce many different wines under various labels, which depend on the Terroir of origin, the type of soil, the quality of the parcels, the age of the vines and the potential of the resulting wines depending of the vintage. Château de Gueyze is the leading brand of “La Cave des Vignerons de Buzet”, it has became a real standard for the appellation. Château de Gueyze is a magnificent 80 hectares (200 acres) vineyard situated on gravelly and clay-limestone soils overlooking the Garonne River. It is the largest vineyard of the appellation and the venerated benchmark of the area. Over the last 25 years, the estate has gained great recognition, producing powerful yet delicate wines. The maturing period in oak enhances the wine’s expression without ever dominating it. The key of the complexity of Château de Buzet comes partly from the quality of the various types of soils: gravely, chalky and clayey, which allow for greater texture and structure; and also from a rigorous selection of the best parcels. "Gueyze" is like "Baïse". It's a Gasconised Celtic word meaning, roughly, "little river". At the edge of the nearby heath, a tiny stream full of trout and shrimps is called "the Gueyze". In other words, water! How has a place with a watery name become the flagship "terroir" for Buzet wines? It's one of the great mysteries of this marvelous soil. And it's here that one of the best wines in Gascony is made. After careful hand-harvest, the wine is fermented in stainless steel tanks, with a long maceration (about 3 weeks) like in Bordeaux to extract the maximum of components: color, tannins, fruit, etc.. And then matured in French oak barrels for 12 months. The wine is finally lightly fined in barrel before bottling without filtration. 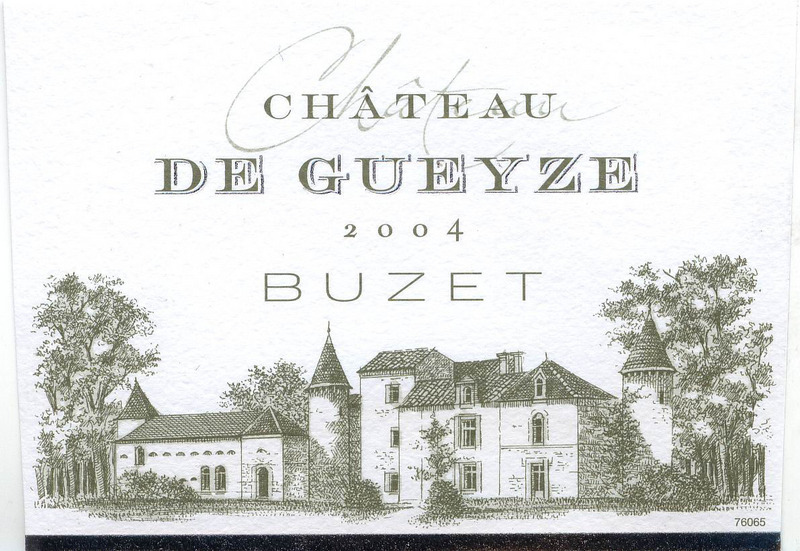 A blend of 40% Merlot, 25% Cabernet Franc and 20% Cabernet Sauvignon, the 2004 Château de Gueyze Buzet red is quite dark in color with good intensity. The nose offers complex and fragrant aromas like ripe dark and red fruit mixed with spices and earth and complemented by menthol and eucalyptus hints. The palate is quite dense and rich, yet well balanced with the same flavors as in the nose and present yet integrated tannins. The finish is soft and harmonious, a touch earthy an elegant tannic structure, a promise of good ageing potential. The last vintage that we had in the store was the 2000, which was truly enjoyable and complex. Although integrated and fairly well rounded, the 2004 vintage seems a touch more tannic with less riper fruit than the 2000, but it still shows promises for the near future. Southwest of France wine lovers should enjoyed it a great deal. I know I did.